The Market for Mass Spectrometry in Clinical Testing Applications covers the global opportunity for mass spectrometry instruments and consumables, including mass spectrometry revenues for 2016 and 2021, regional markets for 2016 and 2021 (North America, Europe, Asia, Rest of World, Total Market), and mass spectrometry revenues by manufacturer for 2016 (%). The report provides revenue analysis and company activity in the market, such as mergers and agreements. Agilent, SCIEX, and Thermo Fisher Scientific are among the manufacturers discussed in the report’s competitor analysis. What is the Market for Mass Spectrometry in Clinical Testing Applications? According to this report, the market for mass spectrometry is 1.5 billion dollars. While the lion's share of the market is research-based, a growing portion of the mass spectrometry industry is for clinical applications. Kalorama Information's report segments these application markets, and details important developments in the industry. Mass spectrometry has been primarily used in research applications, with early applications focused on small molecules. However, development of soft-ionization techniques such as matrix-assisted laser desorption ionization (MALDI) and electrospray ionization (ESI) has made it possible to study larger molecules such as proteins, peptides, DNA, and other large molecules without extensive fragmentation, opening up a whole new world of opportunities as mass spectrometry now moves into the clinical laboratory. 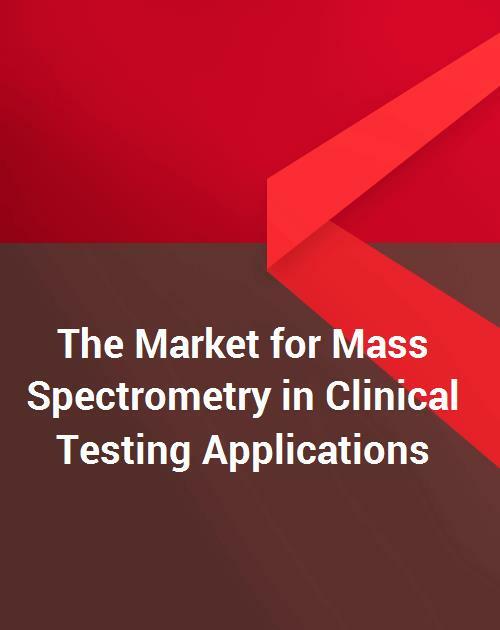 The report looks as well at the market drivers and challenges for mass spectrometry in the clinical lab, including the advantages and disadvantages of mass spectrometry and current trends in the mass spectrometry market. The clinical diagnostic applications of mass spectrometry are expanding. Mass spectrometry has already had a disruptive impact on microbial identification. Mass spectrometry is now being applied to a growing number of oncology applications, and there is a growing awareness of the importance of both genomic and proteomic information for many oncology diagnostic applications. Mass spectrometry has the potential to be applied to other diagnostic applications as well, as discussed in this report. With this market potential, many companies are making deals in this promising area. The report discusses selected investment and financing agreements in mass spectrometry companies, selected acquisitions, selected agreements between mass spectrometry companies, selected agreements between mass spectrometry platform/reagent companies and mass spectrometry software companies, selected company agreements between mass spectrometry companies and diagnostic companies or clinical laboratories, selected agreements among mass spectrometry companies and pharmaceutical or biopharmaceutical companies (includes contract research organizations providing services to pharma companies), and selected mass spectrometry company agreements with academic or other non-profit organizations.